Woohoo! It's finally here! Going to a Comic Con has been on my bucket list for quite some time and since my family lives in NY, the New York Comic Con was just the thing! We got four day passes before they sold out, luckily and a small crew of us got the chance to check NYCC 2012 a day early. Marc (my BFF) and I left out of H-town at 5:40 in the morning after only getting an hour of sleep the night before because we were too excited! So, maybe our lack of sleep led to a little less manic fun on Thursday's NYCC preview day, but we sure made up for it on Friday! 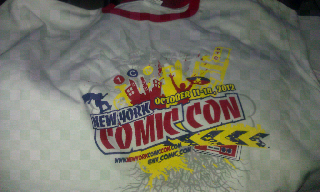 Stay tuned for more New York Comic Con 2012 updates! (Going to see sneek peek of Beautiful Creatures, Carrie and The Walking Dead today!) So I'll keep you posted, friends!! That's awesome! I just went to the one in London this past weekend! We got stuck in traffic & got there a little late, but it was cool. DALE (Walking Dead) was there! I missed the line for photos, but got to see him answering questions. It was cool! Loved all the crazy costumes! I dressed like Ada Wong from the Resident Evil 6 game hehee.